House prices are tangible empirical evidences of the changes of real estate markets in any markets. 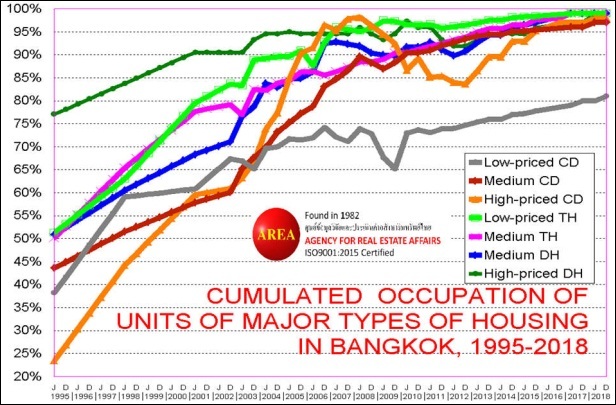 This is a crucial set of data for 26 years compiled by the eldest and largest real estate information in Thailand, Agency for Real Estate Affairs during 1992 to 2018. 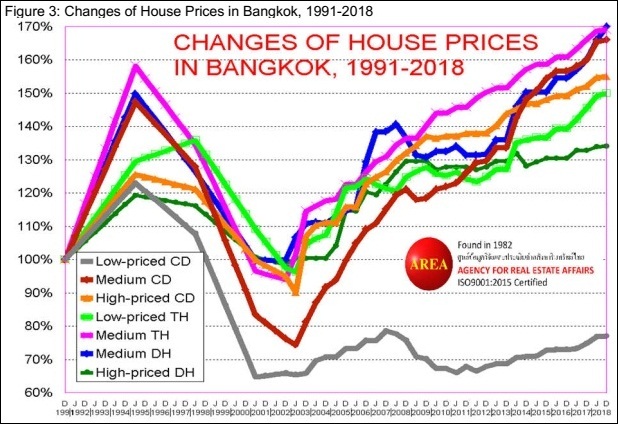 Dr.Sopon Pornchokchai, President, Agency for Real Estate Affairs (AREA) disclosed that during 1992 to 2018, AREA assessed a set of information of price changes for 31 housing estates including low-priced, medium priced and high-priced condominiums, low-priced and medium-priced townhouses (rowhouses) and medium-priced and high priced detached houses. At that time, few high-priced townhouses and low-priced detached houses were not available. 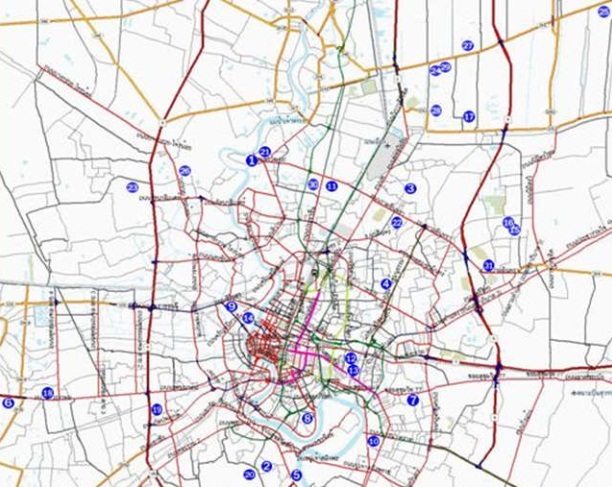 In this study, a map of 31 sample projects surveyed since 1992 were shown to see the locations in different corridors. Prices have been updated every year through market surveys by our AREA researchers and valuers. The findings are in two aspects, namely the occupation rates and the changes in house prices in 31 projects grouped in seven categories. A table was prepared to show the changes of housing prices over a period of 26 years, 1992 to 2018. This is one of the most comprehensive and consecutive set of information on real estate in Thailand and Bangkok in particular. 1. On the whole, house prices during a period of 26 years (1992 to 2018 ) have been increased over time. This implies that Thailand has been developed over time as well. 2. An exception was the case of low-priced condominium (owner-occupied apartment) units. If the price index in 1992 were 1.0 in 2018, it was only 0.77. The decrease in prices was 23% Every year, the prices were down for 1.0% Actually, the prices of low-priced condominiums were increased during 1992 to 1996 which was a boom period for 23% or 5.3% per annum. Then during 1996 to 2002, price index was dropped from 1.23 to 0.77 or a 8.5% drop per annum. This was a very sharp drop during the bust period. Then prices were recovered slowly until now. 3. On the contrary, medium-priced detached had a highest increase in price during the 26 years period from the index of 1.0 to 1.7 or having an increase at 2.1% per annum. Medium-priced townhouses and medium-priced condominiums have also had a significant capital gain as well. 4. It can be observed that properties which had a more significant increase in prices during the boom period, tended to have a more significant decrease during the following bust period as well. 5. As observed, high-priced units of condominiums and detached houses tended to have a smaller increase in price less than those medium-priced ones. Perhaps, the medium-priced units had a larger market size with higher demands. 6. That the prices of low-priced condominiums were down significantly, implies that depreciation plays a vital role. Poor maintenance resulting from poor or inadequate contribution of the residents was the crux. There is a proverb in Nepal saying that buying cheap things would make us cry several times; buying expensive things would make us cry only once". Proper maintenance would help increase in the value of the properties or at least maintain the good prices. Therefore, property management plays a vital role in value creation.